This cable / kit adapts the standard stepper driver connector on a RAMPs^ board (the Pololu driver) or other motion control board that normally uses Pololu drivers to the open source PMinMO standard so you can use any number of open source stepper motor drivers^. 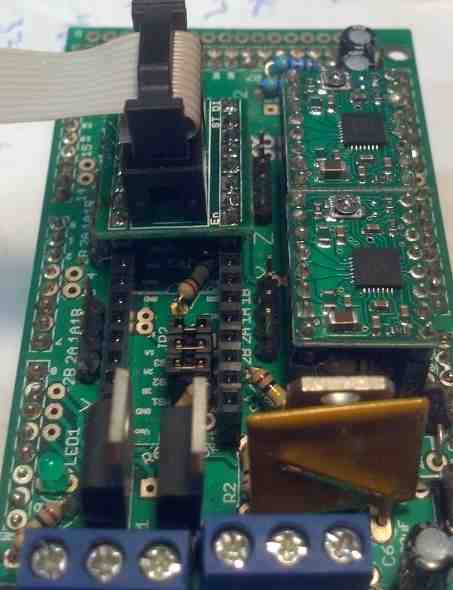 The THB6064AH driver is known to work with RAMPS / Marlin controllers. Assembly: First install the box header on the side of the PCB with the silkscreen, paying attention to the notch that shows alignment. Then solder the headers on the outside. It helps to put them in the Pololu header first, so they are held straight up and down. ENABLE: The square pads on the bottom of the PCB which are separated by a narrow gap, so that the enable signle is not passed on when used with the THB6064AH driver. 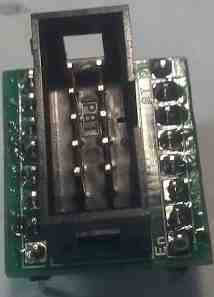 Bridging these pads with solder will cause the enable signal from the RAMPs board to be fed into the driver. However, the polarity of that signal for this driver is the opposite of that for the standard Pololu boards. As a result, the motors will lock when not moving, and release, failing to move, when the RAMPs system tries to move them. The enable signal is not required on the THB6064AH driver because it is enabled by default, and automatically goes into a low power hold when not in motion. If you do wish to make use of the enable line, with this driver you will need to change the polarity in the firmware. For other drivers, you can bridge the gap. 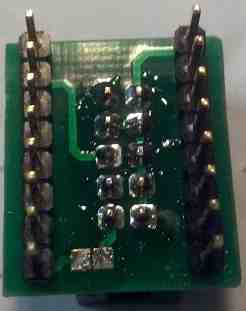 The adapter cable connects ground, logic (+5 regulated) power, as well as the step, direction and (optionally; not recommended) enable signals from the RAMPS board to the driver. Note: Pin 1 on each side is at the bottom edge, opposite the alignment mark on the RAMPs board.